I finally busted out the .45 again after my recent 9mm kick, and I have to say I made a good decision when I grabbed some of the Win3Gun I received from them a short time ago. 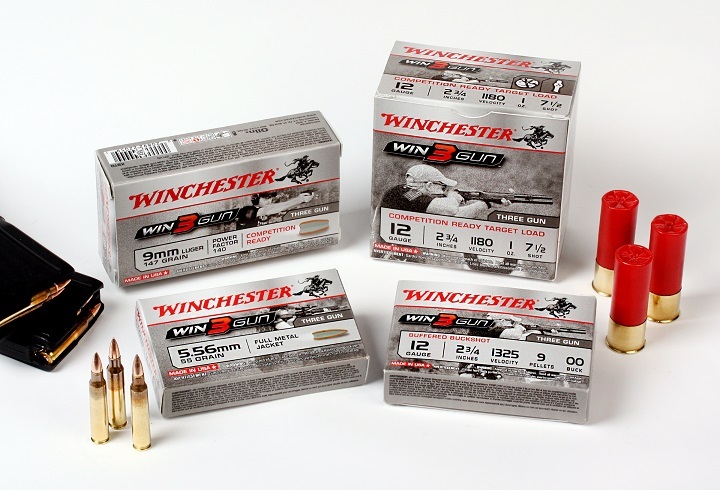 With this product, Winchester went after a demographic of shooters that has gone largely unrecognized by the vast majority of “big” factory ammunition companies, and certainly at this price point. Per Winchester, the MSRP on the .45 will be around $25, which means finding it for less certainly won’t be out of the question. Initial impressions were positive. The encapsulated base of the bullet kept the smoke way down, and it burned extremely cleanly. OAL was consistent, velocities were well above major power factor (hovering right around 800 fps with a 230-grain bullet), and the shape of the round fed smoothly in my gun. One thing that will certainly garner some complaints from reloaders is the small-primer pistol brass. That being said, let’s be honest: this ammo isn’t meant for reloaders, who already load their own practice rounds, so the point is a little bit moot. But if you’re buying ammo with the intent of reloading it later, this stuff certainly isn’t meant for the people with 5,000 pieces of empty large-primer brass in their garage. On the other hand, if you don’t reload and you don’t save your brass, Win3gun is an economical alternative to other, more expensive match loads. Blazer Brass .45 has been using small-primer brass for years, and that hasn’t kept it from flying off the shelves at retailers. Recoil was a bit less than standard factory FMJ, and the accuracy was perfectly acceptable for match or range use (whatever points I dropped weren’t because of the ammo). 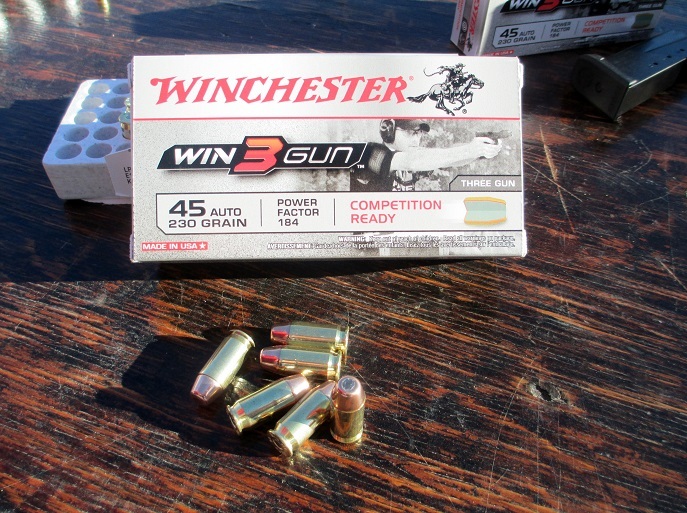 Win3Gun uses lead-free primers and encapsulated bullets, so as I touched on already, the smoke was virtually nonexistent. That allowed for a quick re-acquisition of the front sight during follow-up shots. After I started picking up some brass, I realized that I’ve never seen any ammo burn quite this cleanly (including the older Winchester “Super Unleaded” 147-grain 9mm, which burns up most of the powder in the casing). The brass looks spotless inside, and the gun took about 2 minutes to clean up after shooting because the inside was still relatively clean after 100 rounds of the Win3Gun and 50 of some standard FMJ. 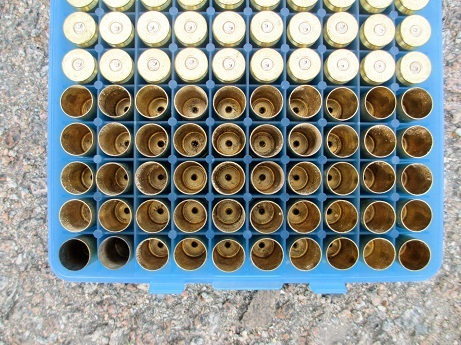 For reference (above, left), the two cases in the bottom left are standard Federal AE and Winchester White Box ball ammo, respectively. I’m not sure what type of powder Winchester used for this round, but it certainly burns clean. My arms didn’t even look like I had a fight with an exploding pepper shaker, and although that doesn’t really bother me, it’s further proof of how clean the Win3Gun powder burns. Win3Gun is currently available in .40, .45, 12 gauge, and 5.56, with 9mm coming in the next couple of months. Loaded at a power factor of 140, the 147-grain 9mm load is something I’ll be very eager to try out. I’m also very interested to see how it compares to the 147-grainW Train load that we’ll be testing out shortly. Win3Gun 5.56 is set to debut between $10 and $13 per box, and 9mm will likely be closer to $15 per 50, which is certainly a fair retail target considering current market prices for standard FMJ 9mm. I won’t buy it just because of the small primers. I do reload and while I mark and retrieve ONLY my own brass, a lot of ranges sell one fired brass to others. There is the issue of small primers. When one of these things come down the pipe, and one will no matter how many times you try to sort them out, something on your press is going to get jammed, bent or broken. So I won’t buy it just because I don’t want to support making things tougher for other reloaders.